Terrazzo, the name alone conjures up images of mediterranean palaces and grand halls. 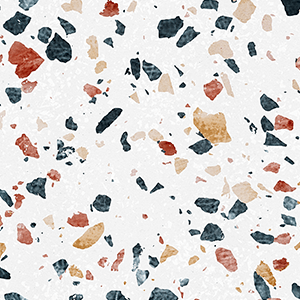 The Terrazzo-style has its origins in Venice where it was used as a decorative way to make floors. Skilled artisans used bits of marble, porcelain and glass to create gorgeous patterns. Nowadays a couple of centuries down the line you can’t turn a corner without running across the Terrazzo-style. Counter tops, floors, high fashion and now your smartphone case or laptop sleeve. Just like the venetian artisans CaseCompany has painstakingly crafted beautifully paters bit by bit. Seven exclusive Terrazzo styles to give your device that classy Italian look. We have classic styles that are directly inspired by age old motifs. But we wouldn’t be CaseCompany if we didn’t have the future in mind. Contemporary colour pallets and bold designs are used to give the rich Terrazzo tradition a new spin. That way we can offer you original prints for your smartphone, tablet or laptop. As always you can customise endlessly to make your design truly unique. Add your name or initials or combine different prints in one design. Whatever you end up doing, your Terrazzo case wil emanate style and class. Molto bene!